Galaxy Note 8 is slightly different from Galaxy S8 Plus. The Galaxy Note 8 offers some improvement. The two devices have similarities and differences. This article is going to compare the devices. The phone comes with a smartwatch, synchronized with the device. The smartphone also has a remote control. This is what makes it more attractive and unique. The phone also has a slim design, and a 4200 mAh battery, which is about 24hrs or 3G talk time. Its rear camera is 12 Megapixels while its front camera is 8 Megapixels. The phone comes with 64GB memory and a screen display of 5.2 inches. It also comes in black, blue, gold, and white colors, and it goes for 850 USD. It has a display of 6.3 inches and weighs 195 Grams. Its rare camera is dual 12 Megapixels telephoto lenses, while its front camera is 8 Megapixels. It has 6GB/8GB LPDDR4 RAM and 3300 mAh battery and about 22 hours of 3G talk time. Note 8 is available in orchid gray, deep-sea blue, midnight black, and maple gold colors. Note 8 is an advancement of the Samsung S8 plus. The two smartphones have many things in common including all glass bodies. The Note 8 is also a slim phone, and it costs 949 USD. The two smartphones have the same display with a curvature. It also blends into both sides of the devices. Note 8’s display is slightly larger than that of Samsung S8 Plus. The screens of the two smartphones are super AMOLED. They also use an Always-On Display. They both use a QHD+ resolution. Note 8 records videos at 3840×2160 at 30fps while S8 can only do 30fps at 1920×1080. Gorilla Glass 5 protects Samsung S8 Plus and Note 8, but Note 8 comes with scratch resistance. They come with 64GB of expandable memory and have the same processor and GPUs. The batteries of the two smartphones are non-removable. They provide wireless charging for the Qi and PMA formats. The physical sizes of Samsung S8 Plus and Note 8 are almost identical. The two smartphones have iris scanners, a heart rate monitor, a 3.5mm headphone jack, IP68 certification, facial recognition, and SpO2 sensor. Both devices also run a version of Android Nougat. They are water and dust resistant too. The Note 8 has the S Pen software while Samsung S8 Plus does not have the feature. The S Pen software has proven to be very fantastic. It enables the owner of the phone to write and responds just like a pen. It recognizes pressure and gradient. The S Pen can be used in activities such as writing messages and signatures. Samsung S8 Plus has slightly curved edges while Note 8 has almost sharp edges. S8 has a pixel density of 531 PPI compared to Note 8’s 522 PPI. Both have the same screen resolution though. The two phones also have different sizes. The Note 8 is slightly bigger than Samsung S8 Plus. The cost of the two phones differ. 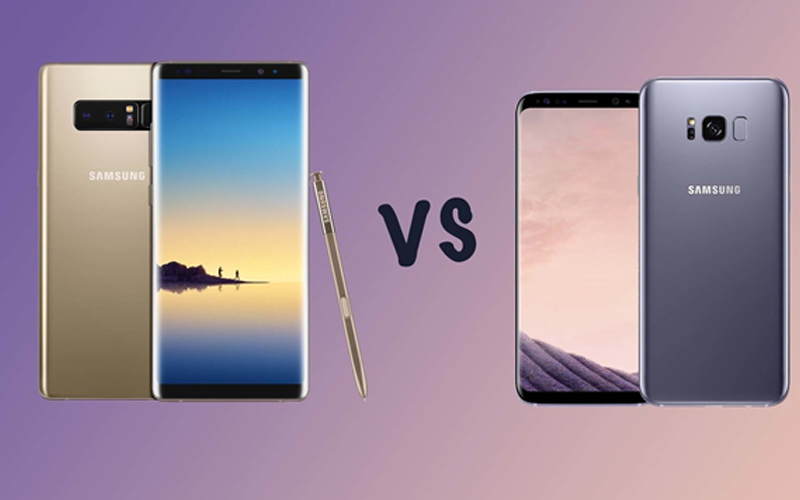 The two devices may be similar, but the superior one is the Galaxy Note 8. Note 8 is somewhat expensive than Samsung S8. The phone costs 80 USD more than Samsung S8 Plus. It has extra RAM, higher Res audio, the S Pen and improved functionality, and the additional camera. This is what makes it worth the additional amount of money. The Samsung S8 Plus will not disappoint you if you do not see the need of the S Pen, or if you do not need the extra 2GB of RAM for smooth operation and multitasking, or wish to save money. After all, both phones come in the latest Snapdragon 835 processors from Qualcomm. A celebrity wedding photographer. In her private time, she loves writing and blogging about photography, travel, and tech trends. She is a graduate of the University of Miami. Xiaomi Redmi 4 Review: A worthy successor? ?